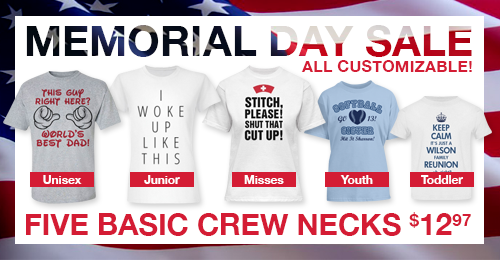 We know that one of the reasons why you choose to get your custom shirts from Customized Girl again and again is because of the great print quality we can deliver! While we agree our printing process is pretty darn good, in the printing business, there is always room for improvement. We are constantly tweaking and adding new features to make our prints better than our competitors! We already have a big advantage because we do direct-to-garment printing on almost all of products, instead of screen-printing. Direct-to-garment printing allows us to offer a full range of colors offered at no extra charge, and no minimums or setup fees. With direct-to-garment printing, we can speed up the printing process while still producing great quality prints and in return, we can pass the savings on to you. In addition, we have also added new state-of-the-art dryers. When newly printed shirts dry quicker, you get a better print and it lasts much longer. So not only do you have a wider variety of selections to choose from, you also receive a higher quality product to wear over and over again! Since we have improved our printing process so much in the past couple of months and have a surplus of basic tee inventory, we want to give you the chance to experience our high quality printing and get a great deal at the same time! SURPRISE LEAP YEAR SALE! CUSTOM T-SHIRTS! CG229: 29% Off $29 or More. Ends tonight, 2/29/12 11:59 PM EST. 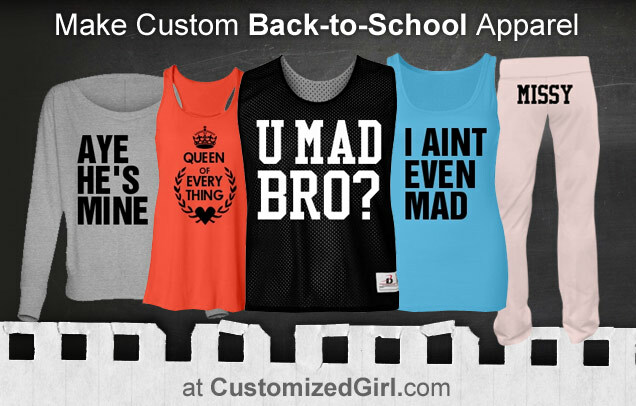 Leap over to the site and get customizing! 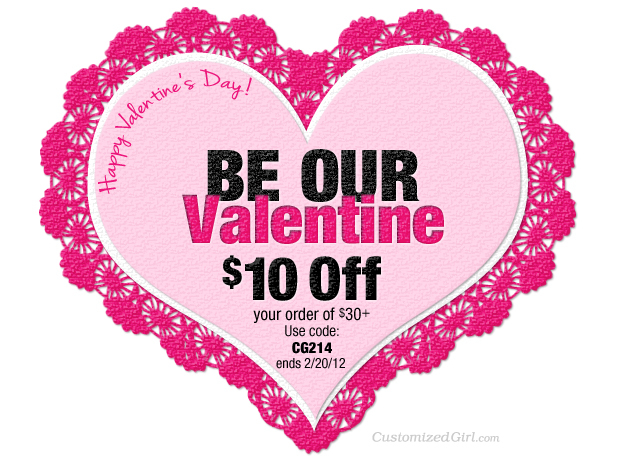 Be our Valentine and save big! Use code CG214 and receive $10 off your next purchase of $30 or more! Hurry, this code ends 2/20/12, 11:59 EST. Shop Now! 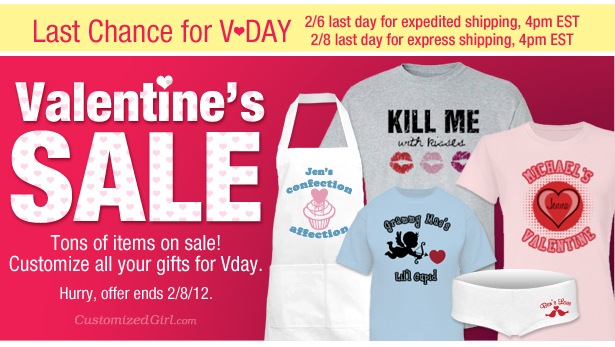 Here’s a sweet sale just in time for Valentine’s Day! Shop now through 2/8/12 and receive up to 30% off selected items! Shop now! This sale is HUGE! Use code CG1227 by 1/3/12 and receive 25% off your entire order! Shop now! Pick your offer starting today! Use code CG126a to receive $5 off, or code CG126b to receive 15% off! 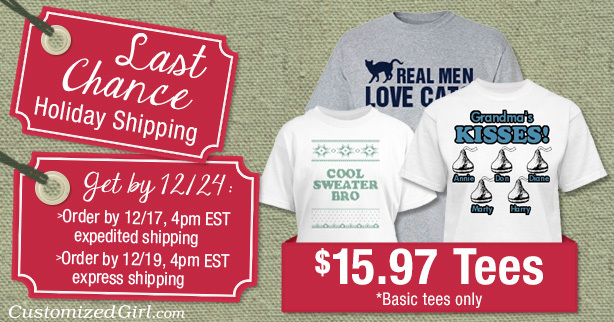 Hurry these deals end 12/12/11, 11:59pm EST. Shop our gift center today and get one of a kind pieces for everyone on your list! Don’t forget to sign up for our emails and get these weekly deals in your inbox!